COMPLETE Brake Line Kit w/Hoses, Clips & Vent Tubes for 1971-75 Ford Broncos with Manual Dual Reservoir Master Cylinders & Drum Brakes. 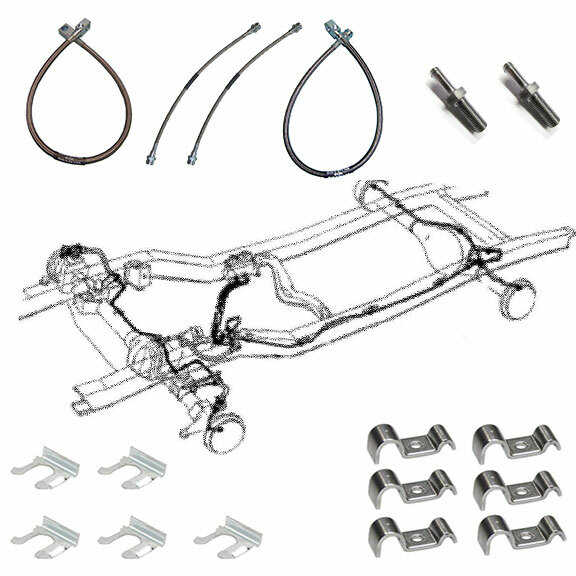 This kit is for ALL 71-75 Broncos w/Dana 44 and Dual Reservoir Mnaual Brake Master Cylinders. For Power Brakes you must either modify the Master Cylinder Lines or use your existing Master Cylinder Lines. For Rear Disc Brakes, you must use the existing Rear Hard Lines. This part fits 71-75 Ford Broncos with Dual Reservoir Manual Brake Master Cylinder and 4 wheel Drum Brakes.